Licenced gasfitting plumbers, who absolutely should know better, have been opting for the “she’ll be right mate” attitude when it comes to the installation of what is known in the industry as multilayer gas piping. This brightly yellow coloured pipework which is required to last at least 50 years, is perfectly suitable for gas supply within the fabric of a building structure. However, the problem comes when this same pipework is installed in an external location without protection from harsh UV exposure because none of it is UV stable. Australia has extremely high levels of UV. As our resident forensic plumber, Russell Kirkwood, explained in this lead ABC News story, there are now literally hundreds of thousands of examples across Victoria and interstate where gasfitting plumbers have gone for the lazy option of continuing the non UV stabilized yellow multilayer pipework installation out to the gas meter and / or to the externally located hot water system instead of using alternative materials like copper pipe for those exposed sections. 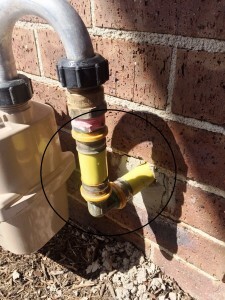 When the yellow pipework is exposed to UV for any extended period of time, the outer layer of PEX plastic progressively degrades and this is evidenced by the fading of the yellow colour of the pipework. Eventually it goes a chalky white/pink and visible cracks appear. This degradation process eventually exposes the inner aluminium core which then itself corrodes (rots away). Eventually this leads to failure of the gas piping system in close proximity to where the pipe enters the exterior skin of the house. This situation poses a significant threat of gas leaks which in certain conditions becomes a ticking time-bomb with a very serious fire and health risk to the property and its occupants. Natural gas is not only flammable, it is also poisonous. 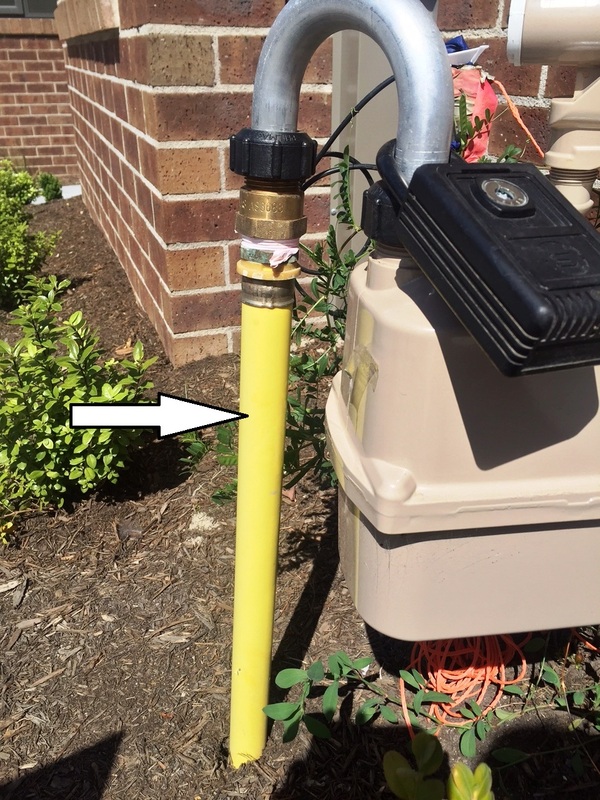 To address the UV issue, some plumbing contractors are opting to spray paint the yellow multilayer pipes in a non-compliant and totally inadequate attempt to protect or perhaps camouflage the pipe; paint is not able to last 50 years. We’ve also seen other plumbers just wrap the pipe in duct-tape – although duct-tape itself isn’t a UV stable product either and will itself become brittle and breakdown over a short period of time if exposed to harsh UV and weather conditions. And then plenty of other plumbers simply do nothing at all and just leave the yellow multilayer pipework out for all to see. 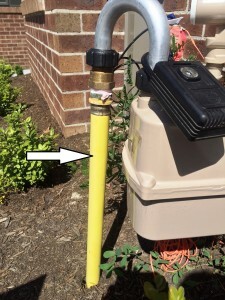 Apart from the UV problem, the multilayer pipes will often be in locations in garden beds and lawns where they can also be easily damaged by garden tools like a whipper snipper or lawnmower; any external damage to the pipe can lead to the same internal corrosion and risk of gas leaks. With nearly 6000 properties allegedly audited by the VBA in Victoria last year and only 9 instances of this problem identified (that’s 0.15%), it’s hard for us to imagine how the VBA have missed identifying and putting a stop to this blindingly obviously and potentially dangerous gas installation practice despite the fact the VBA has issued its own alert to all plumbers about this problem. If your home is one of the many hundreds of thousands potentially affected with this gas service defect, unfortunately it’s not as simple a matter as now having the pipe sleeved over or painted because the damage has already been done. Energy Safe, the Victorian Building Authority and the individual manufacturers all require that UV exposed and degraded gas pipework is completely removed and replaced. There is also no warranty on the product once it has been exposed to UV. The pipe section also can’t just be covered up or painted once the exposure has started. To fix the problem, parts of the internal plasterboard wall and/or external brickwork of the building will require removal so that the affected section of UV compromised multilayer pipe can be removed and replaced. In a typical home costs can be expected to be around $2,000 to $3,000 for every point where the pipe has been exposed to UV; a typical house will have at least one but commonly two points to be rectified. Energy Safe Victoria advises that you should contact the industry regulator if your property has this defect – in Victoria this is the Victorian Building Authority http://www.vba.vic.gov.au/ and in NSW this is the Department of Fair Trading http://www.fairtrading.nsw.gov.au/ . Fair Trading in NSW also issued its own alert about this issue in 2013. In Victoria, the costs of rectifying the defect are fully covered under the insurance of the licenced plumber who certified the work however the situation is not that simple in other states. Metropolis Solutions are at the coal face of consumer protection when it comes to achieving plumbing compliance. If you are concerned about plumbing defects on this issue or any other works carried out by a Licenced Victorian plumber at your property within the last 6 years – contact Metropolis Solutions for expert plumbing assessment and second-to-none preparation of your insurance claim against the plumber.